Looking for something fun, easy, and exciting to do this evening? Look no further than Northwest Brews & Blues at Hale’s Ales from 6:30-8:30 p.m. 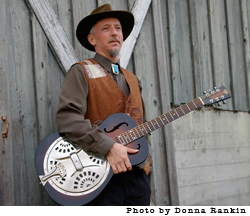 This week, in our second of the Brews & Blues series, we bring you one of the Northwest’s best kept secrets: Cort Armstrong, who never disappoints with his Chicken Pickin’ blues. Don’t miss the opportunity to listen to live music and enjoy local beer all while supporting Northwest Folklife. Fifty percent of the proceeds raised from the sale of O’Briens Harvest Ale at Brews & Blues benefits Folklife. Also, if you haven’t joined Friends of Folklife yet, new members can do so tonight for the very special 40th Festival rate of $40 for the year. Join and we’ll give you a t-shirt AND a beer, compliments of Northwest Folklife! Who can resist such a tempting deal? Last week, we reviewed the O’Brien’s Harvest Ale (purely for professional purposes…of course), and gave it two thumbs up! This seasonal amber ale combines a boatload of delicious hops with a malty backbone that quenches any beer lover’s thirst. Don’t worry though, if you can’t make it tonight, there’s always next Thursday– that’s the beauty of Brews & Blues. Folklife hosts Northwest Brews & Blues every Thursday night in October from 6:30-8:30 p.m. So come hear great local blues musicians and sip beer brewed on location at the Hale’s Brewery. The best part? You can support local culture and traditions while having a great night out! Tonight: Northwest Brews & Blues! Tonight at 6:30 we kick off our new series Northwest Brews & Blues, a weekly event at Hale’s Ales between Ballard and Fremont. Come every Thursday night in October from 6:30-8:30 to hear great local blues musicians and sip beer brewed on location at the Hale’s Brewery. The best part? Fifty percent of the proceeds raised from the sale of O’Brien’s Harvest Ale during Brews & Blues goes to Folklife! You can support local culture and traditions while having a great night out. So come to Brews & Blues tonight and tap your toes to The Jelly Rollers. If you haven’t joined Friends of Folklife yet, you can do so tonight for the very special 40th Festival rate of $40 for the year. Join and we’ll give you a t-shirt AND a beer, compliments of Northwest Folklife! Comments: Comments Off on Tonight: Northwest Brews & Blues!